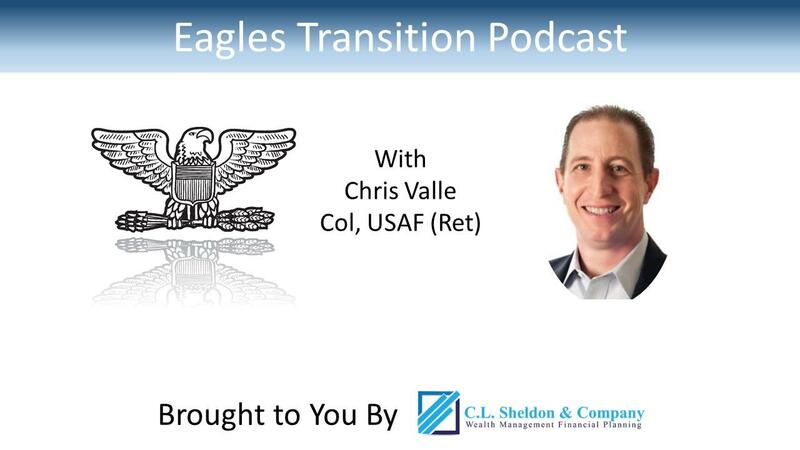 Curt Sheldon: Welcome to the third episode of The Eagles Transition Podcast. Today I'll be talking with Chris Valle. I've known Chris since we first met at the Air Force Academy many, many years ago. Chris currently is a Department Head at DNV GL Energy, a multinational corporation operating in the energy space. Like in the previous two episodes, Chris didn't land at DNV GL right after retirement from the military. He did start out in the energy sector, and through effective networking he found a position with his current employer. Make sure you pay attention to his comments on networking and thinking outside the box when looking for your next position. Curt Sheldon: But before I talk with Chris, I'd like to make a special offer for our podcast listeners. If you go to www.clsheldon.com/eagles, you can get a financial checklist to help you with your transition from active duty to the civilian world. It is designed for you and you can get it for free. Curt Sheldon: Now, on to the show. Curt Sheldon: Chris, welcome to the show. Chris Valle: Thank you, Curt. Good to be with you today. Curt Sheldon: And I'm really excited to have you here today. So far the folks I've interviewed with have stayed pretty darn close to the defense industry. And you've actually gone a little bit outside of that I would say. Why don't you tell us, to start with, where you are working now? Chris Valle: Sure. Company I work for is DNV GL. We are a global quality assurance and consulting company. Work across four different sectors in oil and gas, maritime, business assurance, and energy. And I work in the energy sector. I'm a head of a department which ... And my oversight is across energy efficiency programs around the United States. I started my career here with DNV GL as an Operations Manager for one of those programs. And now I oversee half of our portfolio of commercial and industrial energy efficiency programs for utilities. Curt Sheldon: Okay, thanks. Obviously, you spent some time in the military. What was your last job before you retired? Chris Valle: My last job in the military was I was the Vice Wing Commander at Keesler Air Force Base. And I got to Keesler in 2008 which was three years after Hurricane Katrina wiped out most of the base. Where the tie comes from, my military career of flying jets for 25 years and transitioning into the energy space is that, while Keesler Air Force Base was rebuilding, they took on an initiative to save energy through what's called LEED design, low energy efficiency design. And all of the buildings and the homes that were rebuilt were under low energy efficiency design standards. Curt Sheldon: Pretty cool. So, actually, some experience there that picked up and you were able to take to the civilian sector, or at least get an interest started. Now, you mentioned that you flew jets most of the time in the Air Force. What did you fly? And what are some of your other career highlights? Chris Valle: Sure. Yeah. I started my career flying C-141's. In fact, did three different tours flying the C-141, in Charleston Air Force Base, McGuire Air Force Base, and McChord Air Force Base over my career. I did transition for a period to the Gulf Stream 3, flew out of Ramstein Air Base in Germany. And I was there during the early '90's, and while there, deployed down to DESERT SHIELD and DESERT STORM, and got to be part of the air crew for General Schwarzkopf during Desert Shield and Desert Storm, which is the highlight of my time in the military. Curt Sheldon: Okay. Obviously, a good career and a good run at it. Now you, are you with the company that you started with after you retired? Or, how did your career flow go after you retired? Chris Valle: Yeah. No. That's a great question, and a great story. Probably not too atypical, but I never did know what I wanted to do when I grew up, having flown airplanes for most of my adult life. We moved back to Pennsylvania, which is where my wife is from. And I looked around for different opportunities. I thought I wanted to get away from the DoD sector. I thought that was a great run inside of government, but I wanted to do something outside of government and completely unique. My challenge was, other than that 25 years in the military, I really didn't have a lot of experience in doing anything else. I tried to capitalize on leadership experience that the military had taught me, and parlay that into some kind of management job in different places. Chris Valle: Ultimately, I really didn't have a lot of luck initially getting into a corporate job. So I aligned myself with a startup company that was working in energy services in the startup space, and worked with that. And built up pretty good book of business, but as in a lot of startups, the cash flow there isn't really that attractive in the early stages. And the investors that were funding it didn't really have the appetite to continue that. Chris Valle: As that was winding down, I decided to go back to the golf course, which is where I started my retirement after I first retired. Never made any money on a golf course, but you certainly can have a lot of fun. Went out on a golf tournament for the USO, bumped into a group of engineers. Told them that I was looking for another position, which was now my second position, which is, I think, the key. Key thing for me was, instead of coming out of the military now, just being a guy out of the military, I was a guy who was out of a corporate position, albeit no one really knew it was a struggling startup at the time. And I was lucky enough to get my resume into an operations manager position, and get picked up from there. That's really ... I had to go through a failed startup to be able to get something on my resume that separated me from the military, so that when I could finally land a job in a corporate sector, it looked like I had experience. Curt Sheldon: Okay. Now, you said you met some folks. How did that meeting come to be, and how was it that you ... That sounds like a classic "use your network" or "build a network" type of event there. How, again, could you expound on that a little bit, on how you met those folks, how you were able to get them to help you? Chris Valle: Yeah. And I tell you, it's all about networking. That is the one thing eight years into my post-military career I can tell you. It is all about networking. I met this group with the startup company. I met them at a West Point Society luncheon. The West Point Society here in Philadelphia is a great group of guys. They have an open monthly luncheon. They allow Air Force Academy grads to come. They allow anybody to come, really, and associate with the military. And it's the perfect networking event. They'll usually have a guest speaker. While there, I bumped into a guy who I knew was into commercial real estate, wanted to get into energy. And that's how I got into the energy business, that way. Chris Valle: The other one was on the golf course, which is another great networking place. Just head on out to a golf course, and plenty of time on your hands, and chatting and meeting folks. And get your resume into a system and thing. Really big fan of networking, and it has served me well. Curt Sheldon: Yeah. I think one of my big failures in life is I've never learned to play golf. And I'm so bad at it, I don't think I could ever bear going out on a golf course. That's one that's not available for me. But I think you're right, it does ... I know for a fact that it works for other people as well. Curt Sheldon: Let's talk a little bit about the interviews with the different companies. I'm going to guess that the startup didn't have a real formalized process. But as the company you're with now, I think, employs about 14,000 people, I'm guessing it's a little bit more formalized. If you could, tell us a little bit about that process. Chris Valle: Sure, I will. And I'll even back up a little bit. Before I got with the startup, I must have interviewed for 15 different positions, all of which had some pretty interesting conversations during the interview. Mind you, coming out of the military or retired 06 Colonel. According to my resume, the last position that I had was in charge of a lot of people with a lot of budget at any military base. And I think at a lot of places that became very intimidating for the executives that I was interviewing with. In fact, I could tell very specifically in a couple of cases, people were afraid that I was going to come in and take their job from 'em because of the experience I had, kind of thing. And they were reluctant to even make an offer to me. Chris Valle: In other cases, I think there are some folks that just wanted to make low-ball offer to do some mid-level management position. Which may or may not have been a dead-end job in that particular company. Between all the challenges of the bias and lack of understanding, really, of corporate structures and what kind of leadership experience that we have in the military, it felt like it was very difficult for me to get across that threshold in my first days out of the military. Curt Sheldon: Now, when you interviewed for your current job, was it a one-time shot? Did you have to go through several interviews? Were they group? Were they single? One person, or a little bit of both? How did that work? Chris Valle: It was a little bit of both. It was definitely a layered interview. Went through the HR screening, and then into another manager who became a peer of mine. Interviewed with him. Was very lucky there. He was a previous Army officer. So at least he had an understanding of my background and experience. Also got to interview with the senior engineer on site, who happened to be former Navy. That was to my great advantage. And then the hiring official was a utility executive, prior utility executive with our company. And he was the one who ultimately hired me with a panel interview, which was the last set of interviews there. But I think I got a lot of positive press from the two military folks that I had interviewed with that could help me to articulate the skill sets that the military brought me into a language that the civilian, or, at least, my civilian company here could understand. Curt Sheldon: Okay. It sounds like, if I was counting right, it sounded like about four or so different interviews that you went through that process. Chris Valle: Yeah. It was four different interviews, the last one being a panel one. And even then, a follow-up interview with the actual hiring official. Curt Sheldon: I don't know for sure I would expect, but obviously it wasn't your case, that the panel would be first and then you'd go to the individuals. But I guess companies ... I guess the moral of the story is, there, our expectations may not be exact. Reality may not meet your expectation. Now, were there any questions that you recall that you thought caught you off guard or that you said, "I knocked that one out of the park?" Anything? I know it's been a few years. But anything going back there that you remember? Chris Valle: Yeah. It always struck me about ... People would ask about your experience. And I was, in this position, interviewing for an operations manager position, which is, in our Air Force vernacular, would be the equivalent of a Flight Commander. But to try to take my different levels of experience in the Air Force and to try to shape that the right way for what amounted to this Flight Commander position was my biggest challenge. And then to find the right language. Every industry has its own language. Energy, and in particular, the utility customers that are our clients, utility clients have very different language as well. It's just trying to bridge that gap between taking your experience and turning it into the appropriate terms that will resonate with the folks that you're trying to get hired by. Curt Sheldon: Okay. Now, we did talk a little bit about networking to start with, or earlier, and how that helped you get into the company that you're in. Any other thoughts on networking? I think that's a hard concept for a lot of us to get our heads around. It feels a little bit like we're using people. And we're, heaven forbid, selling ourselves. Any thoughts from your side on how to get that ball rolling as you're getting ready to retire? Chris Valle: Yeah. I think the best teacher that I ever had for networking was my wife. My wife will talk to anybody. And my wife has never met anyone who didn't become a friend. And it's all about just going out and learning a little bit about people, telling them a little bit about yourself. I think where military folks get hung up is, everything we've ever done had a mission focus. And in the networking realm, you're really not clear on what the mission set is. Ultimately, yes, you want a job, downstream. Or, if you're in sales, you want to sell something to somebody. But in those early networking stages, you really just want to find out about each other. What's important to you? What's important to them? And then work your way gently into, "Well, I was looking for my next opportunity. And I'm wondering if you can introduce me to a few folks at your position, or in a different company that you know." I think it's the softer skills. At the end of the day, it's the softer skills that is the hardest part for the military in us to ... And it takes time. It's not a one and done. It's not a 20-minute exercise. It's an experience. And it takes time. Curt Sheldon: Now, in my case, like you, I'm a career changer, going to something very different. I actually did some informational interviews where I ... They weren't completely cold calls, but they were pretty darn close, where I would get in touch with somebody, and say, "Hey, I'd just like to come in and talk to you about the industry. And promise you I won't ask for a job when we're done." Did you try that at all, or just things evolved more ... I guess they'd be more warm leads than what I was doing. Chris Valle: I think I did not try that. But I will tell you that I have spent the last number of years with the local Greater Philadelphia Veterans Network here in Pennsylvania that helps veterans. And that cold-calling and getting yourself out there is one of the things that I do make recommendations for folks to do. It's hard. Because there's a lot of uncertainty in you picking up the phone and things. But, it's like I tell them. The worst thing they're going to say is no. And no is okay. No is an answer. But you don't know it until you ask. And the informational interviews is a great way to go. The other thing I always ask folks, 'cause when I talk to others that are looking for positions, I say, "Well, where do you want to work?" They always want to work where they are. And then you ask them, "Well, what opportunities are out there? And how do you know?" And oftentimes, they don't know. My second recommendation is always to just get in your car, drive to the nearest business park, and take a look at the names of the businesses that are on the building and on the signs. Make a list. Go back and do some research on those businesses. And start making those calls, and seeing if that's a company that you're interested in and asking to learn more about that. Curt Sheldon: That's a really good idea. I hadn't thought about that one myself. Okay. As most of the folks who are listening to this know, and as you know, I'm a money guy. I'm in the financial services business. I have to ask you at least one question about money. Obviously, not looking for any specifics here. But any things that you found either challenging or surprising, or maybe you had a great plan and everything went exactly like you thought it would, concerning your money as you made the transition from active duty to civilian? Chris Valle: Yeah. Good. Well, considering I had no plan, nothing went the way I thought it was going to go. But one thing the military retirement is, and I've said this to a number of folks, I know I'm never going to starve. And I'm very grateful for that and very thankful for that. And it just becomes about the lifestyle that you could lead. And it was when I first retired and moved from Mississippi, where I was assigned, into Philadelphia, outside Philadelphia, where we ultimately are living now, it wasn't walking up and buying a big house. We found a reasonably priced rental property that we could rent for a year until we figured our way out. We ultimately wound up staying there two years until we bought a house that I live in now, which I did buy. And I'm happy to be stable and settled. But knowing that there was that set income coming in my military retirement was always very comforting. It did ground us and keep us in a budget, pretty tightly in a budget. Maybe Christmas during that early first year of retirement wasn't as good as last year. But having that steady income and understanding budgeting and staying to that budget is really what made the difference in that transition. Curt Sheldon: Yeah. I listen to a couple other podcasts that talk about starting financial planning businesses and running financial planning businesses. And a lot of them talk about, it's not the expenses of the business that will cause you problems. It's your lifestyle expenses. And I think that's a valid point as you're transitioning from the military, retiring, is that it's probably not your income that's going to be the biggest issue. It's going to be your expenses until you at least get things settled down. Pretty wise move, there, going into the rental and making sure that you had things in line before making the big plunge. Curt Sheldon: Was there anything that you used or a resource that you found particularly useful as you made the transition. Again, either an online site, a book, any ... A great ETAP program, anything that you participated in that helped you make the retirement transition? Chris Valle: Yeah. I think I read everything. I went to ETAP. It was okay. I'm not sure it was the most useful tool that I had in my toolkit. But I think it certainly was a tool resource that I parlayed off of. The What Color is Your Parachute book, that's a pretty famous book I think a lot of people get. It all goes into the machine. But that transition from 25 years in the military into the vast world of you can do and be whatever you want to be, that uncertainty gap was so big. I'm not sure I could pin my hat on exactly one or two things. But it all goes into the machine and helps orient you each step of the way. Curt Sheldon: Okay. Was there, at any particular points you felt really surprised by anything, or any big, huge ... Not even huge, but something that you said, "Huh. I wasn't expecting that." Chris Valle: I wasn't expecting civilian companies to just have a complete lack of understanding of the value of military leadership. It was ... More than once, not directly, but indirectly, I got the very strong feeling of concern that if this company hired a military guy, they were going to end up with the drill sergeant from Full Metal Jacket, which is an analogy that I use often. And I just ... I can't tell you how upsetting that was to me. And I think that was a big part of a couple of job interviews that I had, why at the end of the day, despite the fact that the interview goes well, good conversation, thought I connected with people, and then you never get a call back or anything. But you can just get that strong sense. And sometimes you hear it secondhand, "I don't know if we want a military guy in our management team. That's not how we lead people." Curt Sheldon: Do you think you were ever able to change anybody's mind with that? Or was that something where they were just so set in it and they had so many misperceptions that it was an insurmountable task? Chris Valle: Yeah. In the failed interviews, where I didn't get the position, I'm convinced I never changed their mind. But I will say, gratefully, for this company, I mentioned that there was a military manager who interviewed me. Then I got hired on. And since then, we've hired on five different military, all retired military officers, to become program managers into our programs across the U.S. I like to think that this company, in particular, really gained an appreciation for that proactive and very operational leadership that we bring to the table. And our suite of managers now represents that. Curt Sheldon: Chris, were there any low points for you as this was going on? Chris Valle: Yeah. No. The low points were ... I think it was probably 10 to 15 ... Hard for me to remember, now, eight years ago. Just interviews that I went on that I thought I did well. And then just never heard from. Those are real ... That really weighs on your ... In some ways, it weighs on your self-worth. After coming out of a highly successful career in the military, and then you can't even convince somebody to hire you to a mid-level manager job, it'll take its toll on your psyche. That's where I was always grateful to have a strong support system at home. Curt Sheldon: And I think, at least in my experience, and I know this bothered me a lot when I was ... 'Cause I didn't know for sure I was going to start the business. But I have found that civilians aren't always as proactive about responding to emails as we were while in the military. Even, you don't get the "I got your email," or, you don't get the feedback that I think a lot of us become accustomed to. And that can have some issues as well. And I know for me, I found that even they wouldn't always reply to an email where I asked them if they received my email. I think most of us as 06's while were on active duty, one of our favorite things to do was to pontificate. I'm going to give you an open mic here for however long you'd like to just ... Whatever topics that you'd like to talk to concerning the retirement transition that we maybe haven't hit on so far. Chris Valle: Yeah. Thanks, Curt. I think if I was ... And I could pontificate, believe me. Any colonel, anybody that sat behind a colonel's desk could pontificate for a while. But I think if I ... Couple of things that I've been trying to help folks with in their transition is, A, a little more focus than I had when you leave on what you want to do. And that focus doesn't need to be too specifically detailed. But if you could narrow it down to an industry or a geography, you could probably pivot off of one of those two. Chris Valle: I think the second thing is, and this is something that we didn't touch on yet. But the civilian world is really big on letters after your name. And Colonel USAF Retired isn't enough letters for you. But things like Project Management Professional, Lean Six Sigma certifications, there's a number of them out there. Even an MBA is another one. All those kinds of things. If you think that in your second career, you're going to want to get into a place that that would benefit you, I would get those certifications and initials while you are on active duty for a number of reasons. One is, in some cases, like in Lean Six Sigma, you can get the Air Force to pay for that green belt or black belt or what have you. And in other cases, in PMP, maybe you can use that as a stepping stone while you have an income in to be able to pay that couple thousand dollars for a Project Management Professional certification class before you're on a real tight budget, on just a retirement income. Curt Sheldon: Okay. Thanks. Is it all right if people connect with you on LinkedIn? Are you open for that? Chris Valle: Yeah. I'd love it. I got a great group of connections on LinkedIn. I use LinkedIn a lot to help connect other people. So, if you can, please connect with me on LinkedIn. I'm Chris Valle on LinkedIn. You'll see me under DNV GL Energy, is the company I'm with. Connect with me. Ask me questions. Use my network to pivot into a company that you might be looking for, all those kind of things that we're talking about today, about the value of networking. I'm happy to support any veteran out there anytime. Curt Sheldon: Okay. Great. Thanks a lot. We'll put a link to your LinkedIn profile in the show notes from this so that people can just click on it if they'd like. And, again, to get to that, you go to clsheldon.com/blog/episode3. And you'll be able to get Chris's profile there, a link to that, if you'd like. Or, of course, you can search for him on LinkedIn. Curt Sheldon: And then, Chris, I'd like to wrap up with my final question that I ask everybody. Go back, if you will, in your mind, to about six months to a year before you retired. What do you wish you knew then that you know now? Chris Valle: I'd have to say, I wish I would have been a little more specific on what that second career was going to be for me. I knew I was going to move to Philadelphia, 'cause that's where my wife was from. And after 15 years of her following me around the world, playing hopscotch in the military career, I committed that we would move back by her family and my family here on the east coast. But a little bit more about that second career would have been helpful to me. I had decided I was going to be in energy or pharmaceuticals, so I started out in those two search groups. But that turned out to be a pretty broad search group. And if i could have ... If I would have known even that the industry that I'm in now existed, I think I could have shortened that year and a half that it took me to actually get a full time position. Maybe I could have shortened that up a little bit. Between the research up front and trying to define a little tighter what my second career would have been, and the value of those initials after your last name. I can't over-emphasize that. Companies will migrate to those initials after your name, PMP, Lean Six Sigma, MBA, anything you got, they will hang their hat on that as well. That would be my suggestion. Curt Sheldon: Okay, Chris. Thanks a lot. I really appreciate you taking the time to talk to me today, and spreading the word to folks. I know you're a busy guy. But, again, thanks. You've been great. And have a great day. Chris Valle: Thanks, Curt. Thank you for getting the message out there and helping others and making that transition easier. I appreciate you.